Innovative intelligence adds to the spraying capacity of the new Hardi Commander sprayer. Home > Innovative intelligence adds to the spraying capacity of the new Hardi Commander sprayer. Hardi introduced no less than 10 innovative intelligent features at the new Commander sprayer release in Adelaide, taking the dealer network by surprise. Combined with the sensational and completely new Commander 5000, 7000 and 9000 litre capacities Hardi have raised the bar even higher. The winner of 11 international awards, the Intelligent Commander is simple to use. “Gone are the days where the sprayer computer was only used to control the volume rate. The new HC6500 presides over a perfect blend of sprayer function management, rate control and guarantees the highest level of performance and application precision.” Managing Director, Graeme Johnson says. The HC6500 displays the operating status of the sprayer and provides vital information to set a whole new standard in user friendly sprayer operation. It takes control of a perfect blend of sprayer function management and rate control. The operating status and vital information is assessed and implemented via finger-tip controls. Automated intelligent features are under the surveillance of the HC6500 and are carried out quickly with accuracy and safety. PrimeFlow is a pressure based circulation system that primes the boom before spraying takes place. This facilitates boom flushing without spraying onto the ground and each nozzle is controlled by its own On/Off stepper motor. HeadlandAssist is a boom management system that helps negotiate headlands via a combination of angle sensors and intelligent software. 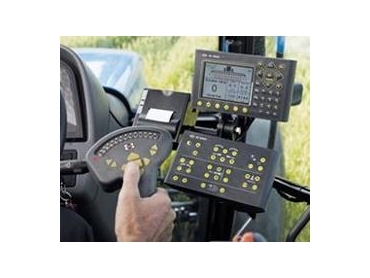 AutoSectionControl virtually eliminates error when turning boom sections on and off. The sprayer position is recorded via GPS and sections are automatically controlled as the boom passes over the paddock. AutoAgitation and TankGauge combine to provide maximum agitation without foaming, while minimising tank residue. A TankGauge monitors the fluid level and the agitation is adjusted to suit that volume. AutoWash is an easier, faster and very efficient sprayer rinse process with up to 7 rinse actions performed automatically. The SmartValves are operated remotely and the process is carried out whilst in the field. Three AutoWash programs can be selected. BoomFlush is a basic rinse which takes less than one minute. FastFlush takes less than two minutes and is used where the same chemical is applied the next day on the same crop. MultiRinse takes about eight minutes and is used when there is a change in chemical or crops sprayed. AutoFill loads the sprayer to the exact volume and prevents over flows. The operator enters the volume required into the HC6500 controller. The filling process is controlled via a FluidBox console on the sprayer. “Intuitive controls, including a handgrip for convenient operation of multiple sprayer functions permits up to 13 boom section management,” said Steve Parker, Sales and Marketing Manager. Intelligent options, like AutoWash, are monitored by the HC6500 and complex tasks are carried out quickly, precisely and safely. The HC6500 menu structure is user-friendly, easy to navigate. Pre-set information is available at the press of a key and soft keys are used to activate optional features like AutoFill, AutoWash and End Nozzles. “More than 27 functions can be set up with visual and audio alarms and the help key provides the operator with a quick guide and instructions,” says Parker. The HC6200 FluidBox is the remote auxiliary control of the fluid system and it is located in the safety locker where it is used in conjunction with AutoAgitation, AutoFill and AutoWash. The HC6400 SetBox controls secondary functions, like boom hydraulics, foam markers etc, with easy to use finger tip control. “Combined with the new Commander the HC6500 gives a truly dynamic and intelligent sprayer that edge to provide serious crop protection when needed,” said Parker.